Favored throughout Europe for centuries, veal has found it's way onto the tables and into the hearts of many Americans. Veal was so revered in 16th century Italy that if it was served at a wedding no other meat could appear on the menu. To this day most people still see veal as a special occasion meat; hence making it perfect for Valentine's Day! This is my second time working with Mountain States Rosen and their Cedar Springs Veal and I would absolutely recommend their product over and over. Cedar Springs Veal comes from a family of farmers in the eastern United States who are dedicated to producing the highest quality product with the highest quality raising standards (you can read more about it here). This fork tender, melt in your mouth meat has a lower fat content than most other meats and is a great source of lean protein, zinc and vitamins B12 & B6. Back to Valentine's Day, that one day a year when lovers everywhere go above and beyond for their other half. The recipe below was created with Valentine's day in mind. 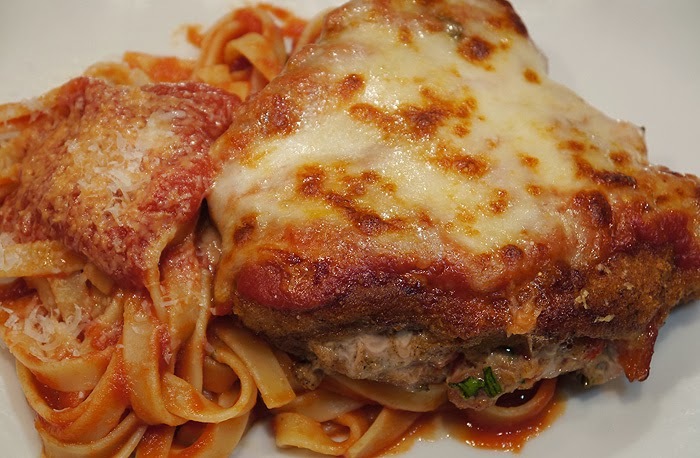 Thick veal chops are stuffed with prosciutto and roasted peppers, lightly breaded and browned on the stove top, than topped with marinara sauce and mozzarella cheese and baked in the oven. The result is quite delicious; making it the perfect treat for that special someone. In the Phoenix area Cedar Springs Veal is available at Bashas', AJ's Fine Foods & Albertsons. Local readers have a chance to win a $50 gift card to one of the three retailers above (see details below). Not local to Phoenix...don't worry we have you covered click here to find a retailer in your area and enter below to win an awesome Flirty Apron. In a small bowl, mix all the filling ingredients together until combined. Set aside. Position a rack towards the top of the oven. Take each veal chop and cut a pocket in the larger part of the flesh. Cut it almost to the bone. Open the pocket and stuff with the roasted pepper mixture. Set aside. Combine the breadcrumbs and next 4 ingredients in a shallow dish. Placed the flour in another shallow bowl. Whisk together the eggs and water. Dredge each chop in the flour, egg mixture and lastly the breadcrumbs, to coat, shaking off the excess. Heat olive oil and butter in a large skillet, over medium high heat. Add the chops and fry 3 to 4 minutes on each side, until golden brown and crispy. Remove from heat. 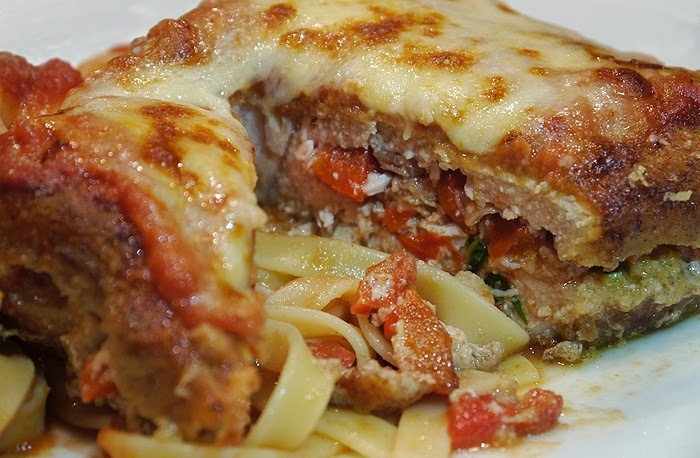 Arrange chops on a pan and top with marinara and the mozzarella cheese. Place pan on oven rack and broil until cheese is melted and starting to brown. Remove and serve. Place tomatoes in a small sauce pan over medium high heat. Add garlic powder, salt and pepper. Bring to a boil and simmer for about 30 minutes. When just about ready add basil and stir to mix. Remove from heat until ready to use. I love veal and can't wait to try your recipe for the chop. Tweeting your post and giveaway! This veal dish looks FAB!! I want to win the flirty apron! I think it would kick up things in the kitchen! O-M-G…this looks incredible! Can't wait to make it! I would like to win a gift-card to Albertson's. Thanks for the giveaway. I would totally do the gift cards - this traveler needs to eat on the road!